“Tribe offers a high-end, designer hotel experience at an affordable rate. Unless you’re an expert on construction techniques you could stay in one of our offerings and you wouldn’t necessarily know it’s built using modular construction,” says Mark Peters. Peters, the founder and director of Tribe Hotel Group, is a visionary who is applying the benefits of prefabrication to bring a fresh, international approach to his industry. He will be sharing his radical ideas at the prefabAUS 2017 conference, speaking alongside Technē Architecture + Interior Design director Nick Travers. Technē is the project architect for Tribe Hobart. Scheduled for completion in 2018/2019, the project, located near Salamanca Place in Hobart’s CBD, will be Tribe’s third hotel completed within two years, alongside an Adelaide project scheduled to commence construction in early 2018 and the completed Perth project, which was designed by Idle Architecture Studio. prefabAUS 2017 presents a meeting of minds for key players in the prefabricated building industry. It is organised by the sector’s peak body, prefabAUS. Warren McGregor, CEO of prefabAUS, says that Tribe and Technē’s presentation in the Future and Innovation session will be filled with provocative ideas. “Tribe have set out to shake up the hotel industry, and integral to their approach is unlocking the full benefits that modular and prefab construction makes possible,” McGregor says. For his part, Peters describes Tribe’s disruptive offering as an edited hotel experience that gives guests everything they need and nothing they don’t. Tribe does collaborative workspaces and sleek meeting areas and bars. It doesn’t do concierges and pricey mini-bars. Modular prefabrication underlies the service approach. “Modular design unlocks cost benefits for the ownership group and these, in turn, are passed on to our guests based on the development saving,” Peters says. As lead architect, Travers explains that Tribe Hobart combines modular construction with traditional in-situ methods for the podium base. Bespoke detailing then transforms the modular structure. 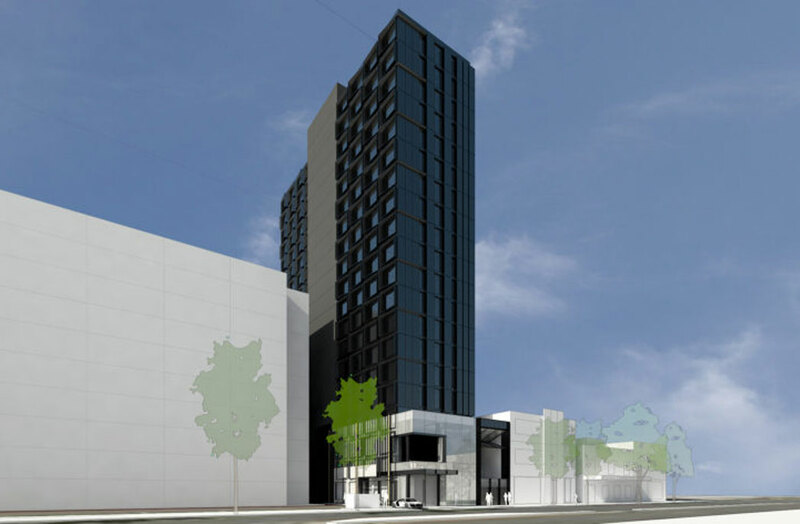 “The project is a hybrid of a completely modular and prefabricated tower of hotel rooms for which we then create a bespoke façade system of claddings, flashings, sunshades, visual screens and decorative components that vary from site to site,” Travers says. There are very few players exploring prefabrication in the hotel sector in Australia, and Tribe is clearly a leader in the space. The practice is more developed in Europe and internationally, however. “The modular approach allows us to bring an international experience into a relatively vanilla hospitality landscape in the Australian market,” Peters says. Renders courtesy Idle Architecture Studio. Interested in prefab? Read about how it’s pushing the boundaries of contemporary architecture here.